A delicious and fun twist on Kevin Dundon's salmon cake recipe. These are crepes, layered with cream cheese and smoked salmon (lox), rolled and cut into pinwheels. Great for a party! 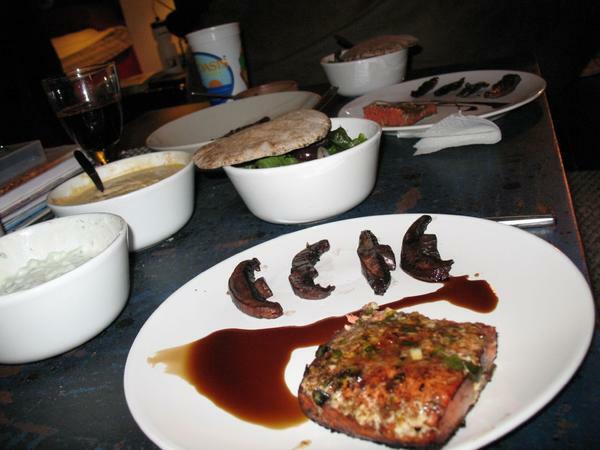 Sear the salmon with sliced portabello mushrooms until they are tender. After searing the salmon, place it in a warmed oven to cook it further. Reduce some wine (a light red, beaujolais ideally or pinot or zin) with the mushrooms), add in more red balsamic vinegar during this process. drizzle tzatiki on the salmon and sprinkle the olive/capers on top.